CANDLEMASS - CHAPTER VI VINYL (LP 180G BLACK) | Online Shop | Wizard LTD. Album: "CHAPTER VI VINYL (LP 180G BLACK)"
Candlemass was formed by bassist and songwriter Leif Edling in Stockholm, Sweden in 1984, and are well known for their epic doom metal, having a great influence over a generation of the genre&apos;s subsequent greats such as Paradise Lost and My Dying Bride - Candlemass themselves taking a large influence from Black Sabbath. 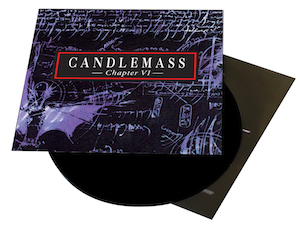 &apos;Chapter VI&apos; was the fifth Candlemass studio album and was originally released in 1992. After a string of classic doom metal releases, beginning with 1986&apos;s iconic and genre-defining &apos;Epicus Doomicus Metallicus&apos;, this was the first album to make a diversion from the pure doom metal style of the band, and was the first release following the departure of popular vocalist Messiah Marcolin, with main writer Leif Edling bringing in Tomas Vikstrom for vocal duties. &apos;Chapter VI&apos; is known for its more heavy metal-based style to the tracks and high quality riffing; evidently more traditional metal inspired on this album. Includes Candlemass favourites &apos;The Ebony hrone&apos; and &apos;Where The Runes Still Speak&apos;. This edition of &apos;Chapter VI&apos; is presented on heavyweight 180gm black vinyl.